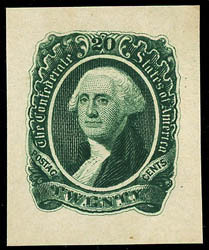 Confederacy, 1863, 20¢ green, die proof on wove, 26x32mm, intense deep color and deep impression, couple small thins, otherwise Very Fine, we know of no other example of this die proof ever offered on the market; with 2017 P.F. certificate. Scott No. 13P5. C.S.A. Catalog No. 13-DDP $4,500. AN EXTREMELY RARE AND POSSIBLY UNIQUE DIE PROOF OF THE 1863 20¢ WASHINGTON ISSUE. 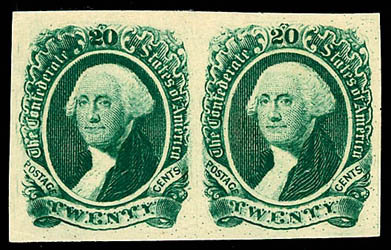 Confederacy, 1863, 20¢ green, horizontal pair (position 35-36R), without gum, left stamp showing distinctive double transfer in "20" at top, rich color and full margins, Very Fine and choice; with 2014 P.F. certificate. Scott No. 13 $300 for variety. 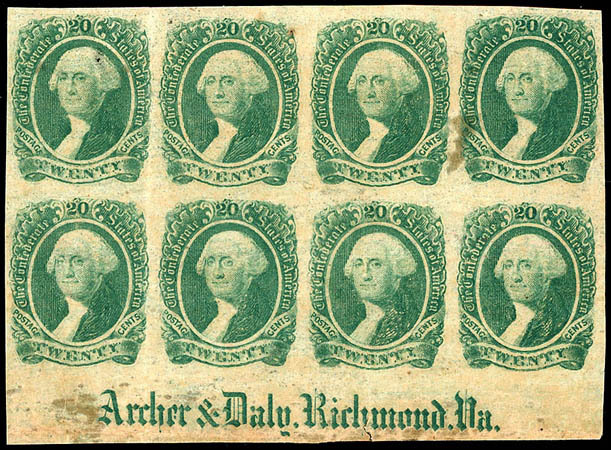 Confederacy, 1863, 20¢ green, bottom margin block of 8 with "Archer & Daly, Richmond, Va." imprint, o.g., hinge remnants in margin, natural gum creases and tiny tear into the "h" in the imprint, Fine appearance. Confederacy, 1863, 20¢ green, horizontal pair, margins large to just in at top, tied by "Albany, Ga., May 21, 1864" cds on legal size allover Hartford Fire Insurance Company illustrated shaded ad cover to Richmond Va.; missing backflap and vertical file folds not affecting stamps, Fine, a rare usage; with 2002 C.S.A. certificate. 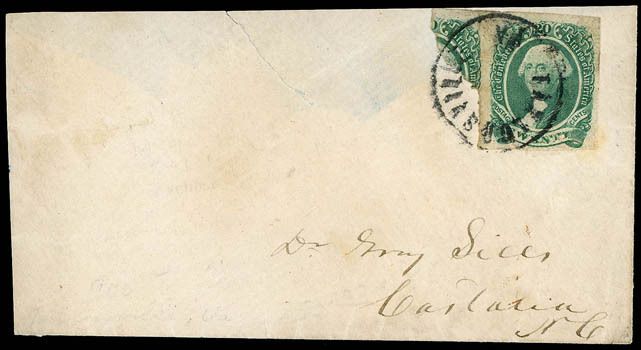 Confederacy, 1863, 20¢ green, clear to large margins, tied "Wytheville, Va., Sep 24" cds on folded letter to Capt. Wm. J. March, Co F, 29 Va Regmt, Corses Brigade, Picketts Division [Army of Northern Virginia], with letter headed "Wolf Glade Va Sept 19 1864" with both mining and military business; letter with pieces out and edge wear due to opening, none of which is visible from the outside, Very Fine. Scott No. 13 Estimate $500 - 750. 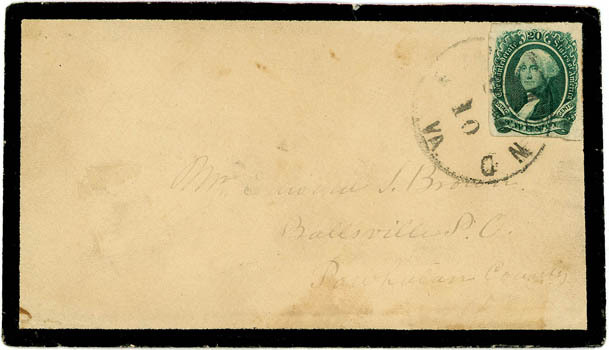 Confederacy, 1863, 20¢ green, clear to large margins, tied by "Richmond, Va., Oct 10" cds on mourning cover to Ballsville, Va., Very Fine, ex-Gibson. 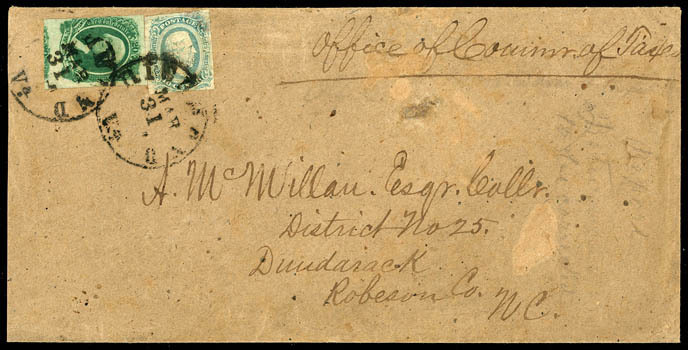 Confederacy, 1863, 20¢ green, margins huge including portion of adjacent stamp at bottom to just in at left, in combination with 1863, 10¢ milky blue on legal size homemade cover to Dundarack N.C., tied by "Richmond, Va., Mar 31" cds's, manuscript "Office of Comm. 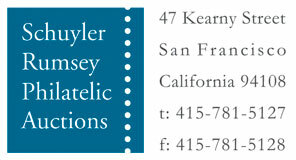 of Taxes" at top; cover slightly reduced at left, Very Fine, a rare triple rate combination usage, ex-Judd. Scott No. 13+11a Estimate $500 - 750. 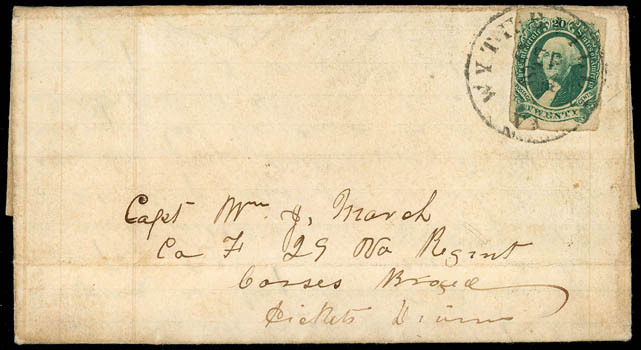 Confederacy, 1863, 20¢ green, large to huge margins including part of stamp at left, tied by dateless "Taylorsville Va" circular postmark on cover to Dr. Sills at Castalia N.C.; cover tear, top flap missing and reduced, Very Fine and choice stamp; with 1986 P.F. certificate. Scott No. 13 Estimate $400 - 600. 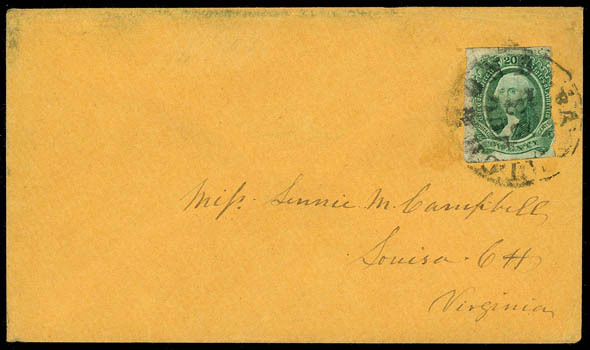 Confederacy, 1863, 20¢ green, margins large to a bit in at right, tied "Richmond, Va., Jul 23" cds on cover to Miss Linnie M. Campbell, Louisa C.H., Virginia, Very Fine. Scott No. 13 Estimate $300 - 400. 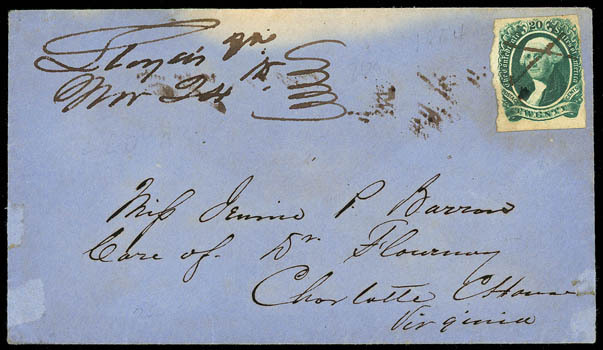 Confederacy, 1863, 20¢ green, clear to large margins, manuscript canceled on cover to Charlotte C.H., Va., matching "Lloyd's, Va., Nov 24th" postmark; cover edge fade at top, otherwise Very Fine; with 2010 C.S.A. certificate.